An unnatural silence inside the sanctuary of DeKalb’s First United Methodist Church gently gives way to the haunting tones of hand chimes, ringing out a melody that seems familiar. People in the pews quietly nod their heads, some mouthing the words they’ve known all their lives. Meanwhile, four video camera operators – including one in the balcony, and one on the move, prowling for close-ups and interesting angles while his long cables slither behind him – film the proceedings. Microphones on tall boom stands perch high above the altar. Eric Johnson, director of Music Ministries at the downtown church, gives one final motion to end the song after its rousing conclusion. Silence again. Then, from a makeshift control room, cheers. 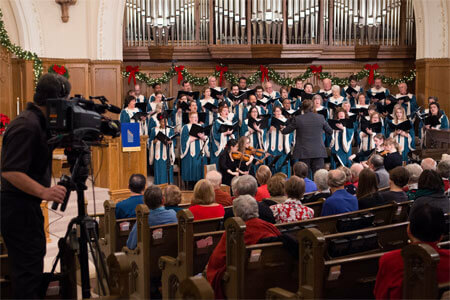 Yes, it’s a hit – and one of many Christmas pieces that will reach the ears and eyes of not only the small crowd that gathered that Saturday afternoon but a television audience around the world, thanks to cable network RFD-TV and Chicago media legend Orion Samuelson, who each year selects a rural church choir to record a Christmas concert for broadcast. 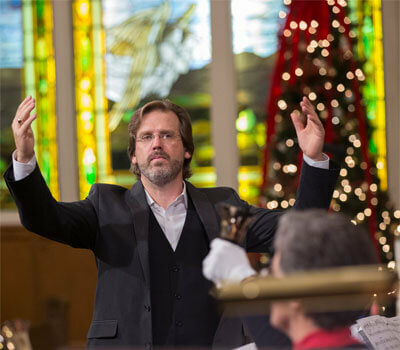 RFD-TV, available on Dish Channel 231 and DirectTV Channel 345, will air the concert at 7 a.m. Saturday, Dec. 19, and at 5 a.m. and 5 p.m. Sunday, Dec. 20. It also will air at 5:30 a.m. Sunday, Dec. 20, on WREX-DT from Rockford. Viewers who tune in will spot a few NIU employees – Johnson, director of Choral Activities in the NIU School of Music, chief among them – as well as several students, six of whom are Sunday morning regulars and living, singing examples of NIU President Doug Baker’s “triangle model” and the value of his pillars of Student Career Success. 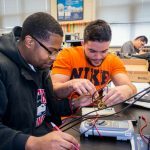 NIU’s collaboration with the church affords dual-mentoring opportunities between students and local residents, provides students with a real-world place to nurture and practice their skills, spreads the gifts of NIU employees beyond campus and, ultimately, boosts Baker’s pursuit of thriving communities. William Koehler, a Distinguished Teaching Professor Emeritus at the NIU School of Music, is the church’s longtime pianist. Ron Barshinger, an NIU library operations associate and “a son of this church,” has played the organ there since 1990. 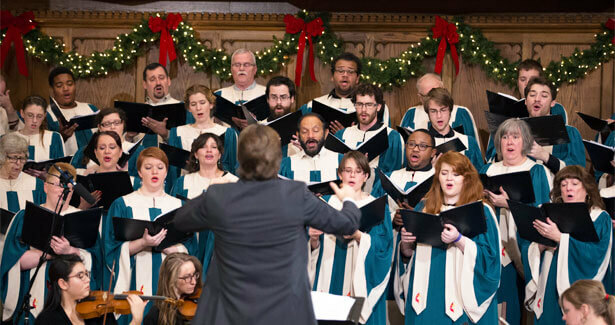 Deanna Frances and Chris Jackson haven’t worn the green-and-white choir robes nearly as long, however. 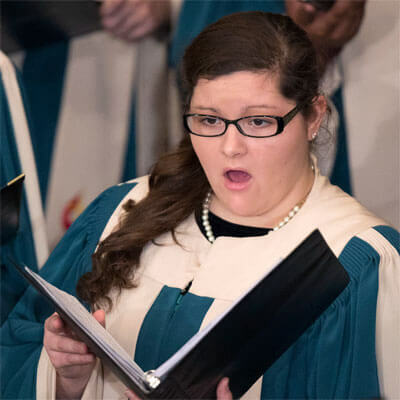 Frances, a senior music education and vocal performance major from Shabbona, and Jackson, a second-year graduate student in vocal performance from Cincinnati, are two of the current benefactors of scholarships administered by the school and the church through the NIU Foundation. 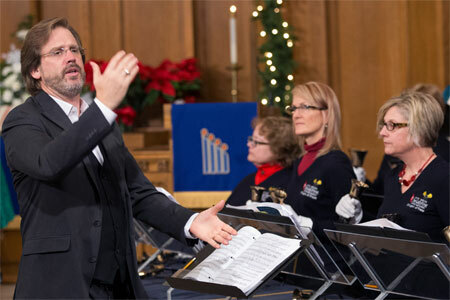 Created by a major donation made by an FUMC congregation member, the Samuel E. Bradt & Bertha Glidden Bradt Memorial Fund helps music majors pay for school while simultaneously adding their talents to the church’s music ministry during worship services and Wednesday night rehearsals. Frances is enjoying the additional opportunities to sing and the chance to learn how to blend her voice with “other kinds of singers,” including some who are octogenarians and one who has special needs. She deeply appreciates the open arms that have embraced her. Jackson keeps a close eye on Johnson’s approach to teaching songs to his volunteer singers. 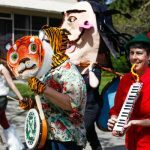 “It gives me another view of music and music education. I spend a lot of time at school seeing how students learn, and it’s good to see how people who aren’t studying music learn. It’s been a good experience,” Jackson says. He loves the commitment of the church choir members, he adds, and says he’s always more than happy to answer when they ask him if their pitch is on. Sharon Banks-Wilkins, who retired from the university in June of 2014 after nearly two decades of working for the NIU Board of Trustees, joined the church choir four years ago. Banks-Wilkins appreciates not only the student participation – “It’s amazing how you can throw people together like this and still have a really decent-sounding group. I had a lady who was in the audience say to me that it sounded like one voice. I can’t wait to see the recording,” she says – but also her chance to learn from Johnson. “I like singing in the choir because I love the music and the message it gives. Eric’s direction has helped me significantly over the years with my voice. I sang in school, and a teacher made me stop singing altogether. She said she couldn’t hear anybody else,” she says. 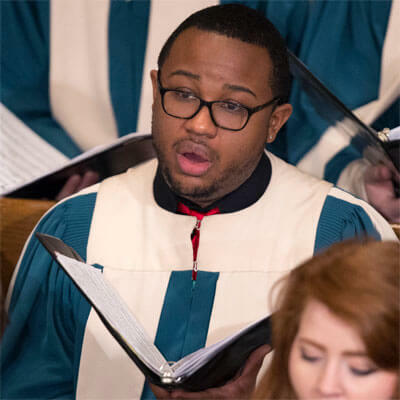 Judd, appointed to FUMC in July, is proud of the close connection between the church and the university. Being “a loving neighbor” to NIU is not only critical, he says, but scriptural. "A Week in the Life of NIU"